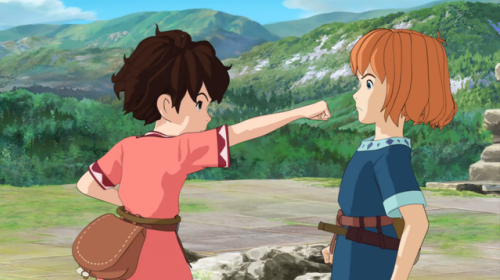 On the one hand, I think it’s a real shame that Sanzoku no Musume Ronja (Ronja the Robber’s Daughter) wasn’t covered more by the anime blogging community while it was airing. On the other hand, I also wish Ronja hadn’t almost put me to sleep for about half the show. I’d like to believe I would have given Ronja a shot even without knowing Studio Ghibli’s Miyazaki Goro was in the director’s chair. Most children’s anime these days tend to be exceedingly long-running affairs attached to big-name franchises, yet here we have a regular two-cour series based on an 80s Swedish fantasy book; that alone is interesting enough. Our titular heroine is the daughter of a bandit chief, whose clan of robbers inhabits the woodlands of Medieval Scandinavia. Granted, Ronja’s episodic adventures navigating the surrounding forest, and her eventual sibling-like relationship with Birk, the similarly-aged son of the neighboring robber clan, may not make for the most exciting of premises. However, it’s always good to see more variety outside of the usual teenage protagonists and Japanese school settings, and I’d hope I’m not the only one to think so. The fantasy elements of Ronja are definitely a highlight of the show. The forest is populated by more than just foxes and wild horses – most notably also by a flock of harpies, whose main hobbies appear to include raking people with their giant claws and carrying them off to be eaten. Luckily, these harpies don’t appear to be the brightest of creatures, but their very real threat greatly aids in upping the tension during several episodes. Another major positive of the series is that there are some fantastically-crafted moments scattered throughout, and occasional emotionally powerful scenes work to make up for the long periods of inactivity that Ronja suffers from. Even so, said periods of inactivity get to be an obvious problem. Deliberate pacing has never bothered me, and I’m willing to give Ronja a certain amount of leeway given that it’s a young children’s show; I can’t judge it in the same way that I’d judge an adventure show targeted towards an older target audience like, say, Magi or Hunter x Hunter. That said, there are whole episodes where literally nothing happens beyond Ronja running around and pointing out how beautiful the trees are or telling everyone how happy she is that spring is on the way. It’s heartfelt, sure, but for a slice-of-life adventure title, there’s just too much of the former and not enough of the latter. Compounding this issue is the scripting, which isn’t bad in and of itself, but again doesn’t usually make for a particularly gripping watch. On the positive side, Ronja feels quite realistic in terms of how our heroine comes across, and she’s far from a stupid child. However, Ronja looks to be around eight years old, and as she does act her age, there’s not a great deal of extremely clever or deeply profound dialogue to be had here. 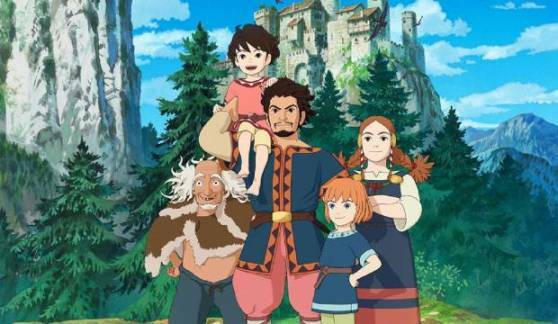 The adult members of the cast – Ronja’s mother and father and the rest of Ronja’s robber ‘family’ – are a fun and lively group to witness, but unfortunately the show doesn’t seem too concerned with giving them anything much in the way of character development. 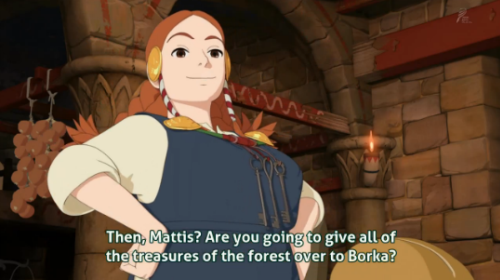 Ronja, and in later episodes Birk, are perfectly fine and even refreshing as main protagonists, but it would have been nice to spend more time with someone like Lovis, who’s a pretty awesome character in her own right. Switching over to the technical aspects of Ronja, there are once more some fairly obvious cons as well as pros. I suppose the most noticeable aspect of the visuals, and no doubt the one aspect that stopped plenty of people from even giving the show a chance, is the CG. This is an entirely 3D-animated, CGI series, and it looks… well, not terrible, but not fantastic either. This visual style will never be to everyone’s taste of course, no matter how good it is, but even though I eventually got used to it, the character movements aren’t anywhere near as smooth as I would have liked. Thankfully, the lovely background artwork helps to deflect this, and that’s an extra big relief given how integral the natural scenery is to the story. Meanwhile, I could take or leave both the music and the voice acting. Some of the background music is some nice enough and the ED theme isn’t bad, but the OP feels insipid and doesn’t really do anything for either me or the show. The voice acting is serviceable but nothing to write home about, and if for some reason you’re married to the idea of only having famous voice actors in your anime, then you’re going to be very disappointed – in fact, of the entire vocal cast, I only recognise two of the names, both of whom play extremely minor roles. This particular point isn’t actually a negative as far as I’m concerned, but overall I’d say that Ronja isn’t especially inspiring in terms of either its visuals or its sound. It’s hard to say exactly what grade I’d give this one. I daresay that the lack of action will put many people off, and in all fairness, I do think the show could stand to have a little more action while still remaining in keeping with its demographic. Still, there’s some genuinely good storytelling to be had here, as well as a kind of timeless charm. My advice to anyone still reading this far – especially if you’re in the habit of complaining about how cliché or moe or whatever else anime is these days – is to at least give Ronja a go. Question of the post: For those who have seen Ronja, what did you think of it? For those who haven’t, is there any specific aspect of the show that puts you off, such as the visuals? This entry was posted in anime, review and tagged sanzoku no musume ronja. Bookmark the permalink. Do you happen to remember how much of the series was filler episodes? When I watch certain older series with a lot of filler, I try to find lists saying which episodes nothing happens in, and I can safely skip. If there’s not too many filler episodes I’m thinking of giving this series a shot. I guess that really depends on your definition of filler. There are a lot of episodes in Ronja where not much happens, because this is just a not-much-happens kind of series most of the time. However, the ‘next time on Ronja’ clips at the end of every episode probably give a fairly good indication of whether or not you could skip if you wanted to do so. “My advice to anyone still reading this far – especially if you’re in the habit of complaining about how cliché or moe or whatever else anime is these days” Yup that sounds like me. I’ll be sure to give a try. From what I see, and from what you have written, it at least deserves a chance. Great post! Thanks, and I hope you end up enjoying the show! Nice to see anime that isn’t set in Japan. I seem to have heard of more of those recently, is this something of a trend or just coincidence? I don’t think it’s a trend as such, as there have been plenty of anime over the years that haven’t been set in Japan, particularly those with fantasy and sci-fi themes – although the number of anime that are set in Japan will undoubtedly always outnumber those that aren’t. This isn’t the first time Ronia got adapted for the screen, actually. The first was a highly successful Swedish live-action movie in the 1980s, whose adaptation was personally overseen by its source author, (the now late) Astrid Lindgren. Also, in the 1970s Miyazaki Hayao had been negotiating with Lindgren to make an anime movie version of Pippi Longstocking, another famous work of hers. She ultimately vetoed the project, although concept art still exists. Yeah, I know about both the live-action movie (though I haven’t seen it myself) as well as the potential Ghibli project that unfortunately never got to see the light of day. Shame about the latter. Have you ever read the source books before? I've never read a Lindgren work, although I did go through an Enid Blyton period in those days. I read a little Pippi Longstocking back when I was a kid, but nothing else of Lindgren’s work. Haha, I do likewise remember reading quite a bit of Enid Blyton though. Hmmm, given that I’ve continued to watch Sidonia and have seen CG animation creep father and father into more higher profile anime, I don’t find it to immediately be a turn off. I think I’d have to see it in action to judge. I fear more the show being outright boring from your description. I have no issue with deliberate pacing either, but to sit through episodes where show does little more than fap to its own production is beyond my patience at the moment. I really want to give this a shot, but my feelings on this show seem as tenuous as they can be right now. Gotta say, I love the design of those harpies and really wanna see them in action. 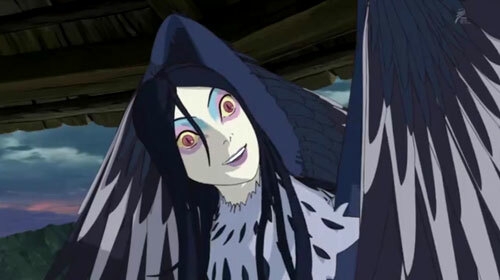 You don’t see harpies too much in anime. I’m used to brutally murdering them in God of War games. 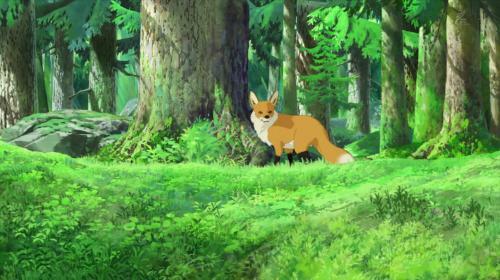 The CG in Ronja was a distraction at first, but I eventually got used to it. I think it works a lot better in Sidonia, but to be fair, I’ve also seen much worse than Ronja. You’re right though – those harpies look great and are one of the more arresting aspects of the show. I think it would be pretty harsh to say that Ronja does little more than fap to its own production. To me, the lack of action seems to have far more to do with the genre combined with the demographic than with any kind of pretentiousness or pride. Regardless though, I don’t doubt that many viewers will find this too boring to watch the whole way through. I kinda wanted to watch this, as I am a huge womanchild and enjoy things for kids. But I always feel that I have to get to know things in order and I never read the book, despite it being a very popular title for children in my country. When I was the right age I have read some books by Lindgren, but was mostly focused on Polish authors – not for some sort of patriotism, more because the reality was much closer and recognisable to me. And I kinda like the wordplay, which is always better in your native language that a translation. I don’t even mind the, uh, unique art style of Ronja – people are complaining about Arslan or Disk wars: Avengers and I see that they don’t look that good, but I don’t mind. I even kind of enjoy QUALITY, dropped Kindaichi Returns because of awful writing and pacing, not the production values, which entertained me. And now I feel kind of old to buy and read a book for little children. Looks like Ronja will stay in my backlog for quite a while. Well, this anime series doesn’t require any prior knowledge of the book at all in order to be able to fully enjoy or appreciate it. It’s of course up to you, but personally, my viewing experience of Ronja never felt in any way limited, and the only thing I’ve ever read of Lindgren is Pippi Longstocking, so long ago now that I don’t even remember it. Oh, I know that the book is not required and I would be really surprised if it was for any adaptation of literature for children. But I just _can’t_ get over this. I am even aware that it can both increase the enjoyment (as how knowing Journey to The West did for me with Dragon Ball), or decrease it (as how I had it with Moomins). I like this anime, its so refreshing to watch. I love the story, simple yet you’ll get hook to it. MangaFreak has the most popular and the latest manga/manhwa scanlations that you can read for free. We also have a community were you can meet new friends. Enjoy reading Naruto Gaiden Manga, Bleach Manga, One Piece Manga and Fairy Tail Manga. “Relaxing” is a good word for this series. While it was certainly slow, it made me realize how long it’s been since I saw a show that was willing to let a moment breathe, and didn’t feel the need to overwhelm me with stimulus at every other moment. Did it go too far in the other direction? Maybe, but I never really hated the show for it. Personally, I loved the atmosphere, despite the weird animation on the characters, and Mattis was a joy to watch whenever he was onscreen. Not the best anime, sure, but I always found myself pleased after every episode. Yeah, it’s really nice to just sit back once and while and watch something that doesn’t make too much noise or try too hard to appeal to any particular fanbase – as you say, to let itself just breathe. And you’re right, Mattis is a fantastic part of the show, although Lovis is pretty much my hero.